Congratulations to Hollyhock’s Alfa Romeo “Romeo” for completing his AKC Champion title. Romeo just turned 13 months old and it’s clear that he enjoys going to dog shows and strutting his stuff in the show ring. 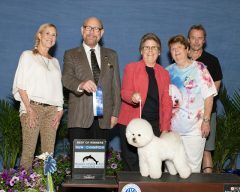 Deb Gibb and Linda Rowe hope to convince his proud owners, Anne and Tony Platt to let them continue showing him for his Grand Champion and International Champion titles when the opportunities arise. Romeo may also pursue his Owner Handler ranking in 2019. 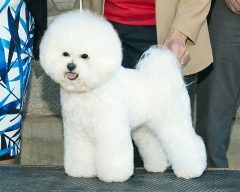 In 2018 he ranked #16 for Owner Handled Bichons. Congratulations! I was honored to help touch up his bangs for he won! Another BIG weekend for Holyhock. Congratulations to all. Please send info for club awards so we can celebrate Romeo at our holiday party.